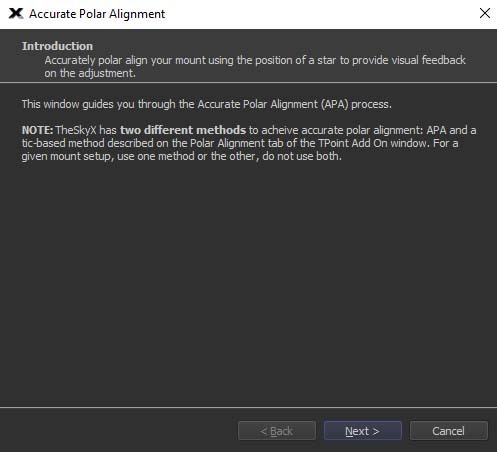 APA is a very accurate way to achieve polar alignment with your Paramount and TheSkyX. Make sure you have the latest version and build of TSX, version 10.5 build 10305 is the current full installer for Windows and version 10.5 build 11444 is the current full installer for Mac. There is also a daily build from 07 December 2018, 12034 for Windows and (08 Dec 2018) 12033 for Mac. The #’s link to the SB site and if there is a newer build you will see it. Note: You have to be a registered user of the SB forums and have a valid TSX subscription to download the software from the SB site. Using the latest daily build is recommended. The wizard can be found under the Tools menu. 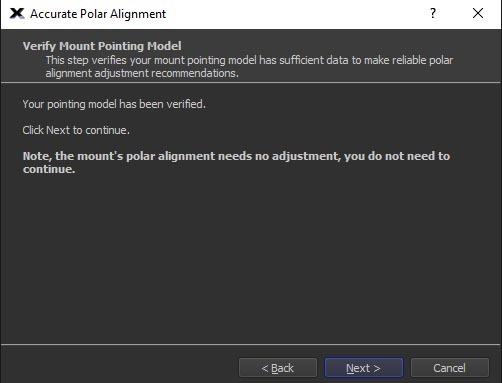 Before you start APA you will need to be roughly polar aligned, use the RPA (Rough Polar Alignment) wizard for this. 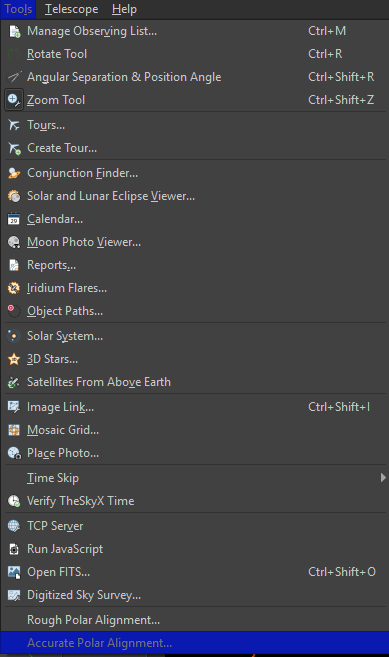 Tools menu just above APA. Once roughly aligned you will want to make a TPoint model of about 30 stars, 15 or so on each side of the meridian (you can try only 10 if ya want but 30ish has been good in my experience). Because you’re only rough aligned its possible to be a bit off when you first start the model (after 6 samples the model will get much better, 6 samples is required for the model to start working). Default bad pointing criterion is now 5° so all should be good. If you get a bunch of error 733’s while making a model chances are you’re quite far off (more than 5°’s) and a better rough alignment would help the modeling complete. Once complete go ahead and start the APA wizard. 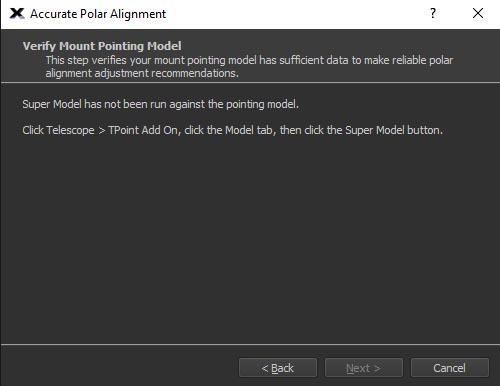 Note: The Tic based method utilizes the the Polar Alignment Report from TPoint. 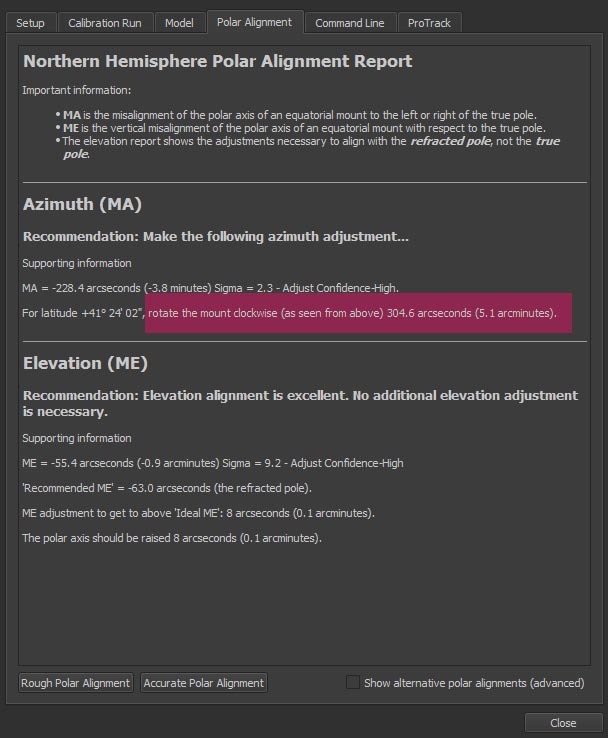 You adjust the mount based on the recommend moves from the report. Both methods work, you must use one or the other, not both. You must Super Model your new TPoint model for APA to continue. Once Super Model has been applied the wizard will tell you the model has been verified and you can continue. 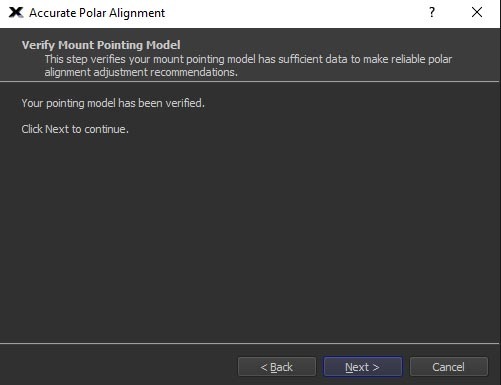 If you happen to have nailed the alignment with the RPA wizard you will see this message. If you didn’t nail it with RPA, APA will give you a choice of stars or you can choose your own. Typically its easiest to just use the APA wizard star with the highest % of suitability (If you set any limits already make sure the star is not outside the limits). Go ahead and slew to the star of your choice (if a APA chosen star just double click on the star name in the box then click OK to slew to the star) and carefully center it with the motion controls (you can also right click on the list and choose to do a closed loop slew but its not required though it will ensure you are on the correct star). Click next when centered. After clicking next the star will be offset by the control system. 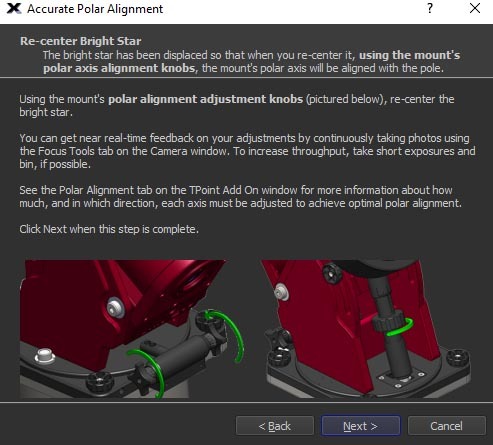 Use the mounts Azimuth and Elevation adjusters to re center the star. 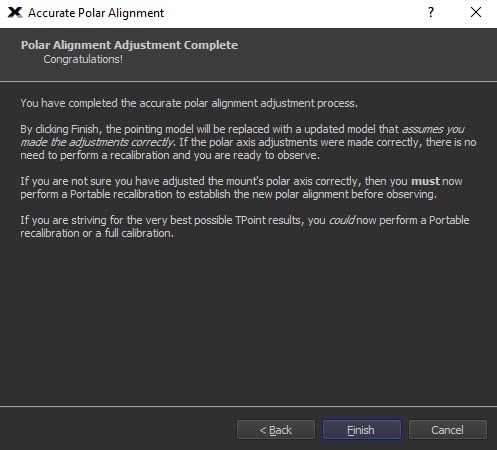 If you look at the Polar report from the TPoint model this will give you a good starting point of how much to adjust each knob and which way (this was done with the simulators so no tics, with a live mount you will see how many ticks to adjust by). Once the star is centered as good as you can get it click next. Once you’ve clicked finished that’s it, you’re done. The TPoint model has been updated with the adjustments you made and there is nothing else to do but start imaging. If you want you can do a recal portable mount just to make sure but if the adjustments made were correct this is not necessary. Once you’ve done this a few times you’ll get quick at it, great for portable imagers. If you have a permanent setup after all is done I’d go ahead and run the giant model you’ve always wanted. Keep in mind if you do a 300 ~ 400 + point model the PA report will probably suggest an adjustment. This will happen because you have a bunch more samples to average, I have found it’s best to leave it, TPoint will take care of any issues. 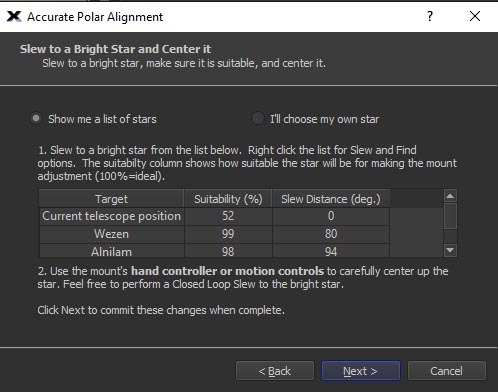 Some folks are not sure if the polar alignment finished correctly, easy way to check. When you are done with the APA adjustment simply All Sky Image link the field after the adjustment was made. With your star labeled and/or arrow noting the position it makes it quite simple to see if the star you selected is actually the star centered in the field after the adjustment was made. If Image link reports a mirrored image remember you will need to adjust in the opposite direction. To label the star or add an arrow you will need to open My Chart Elements (Ctrl 5). Highlight Add Label (or Add Arrow) and hold down Ctrl and click on the star on the sky chart. To remove the label or arrow highlight it in My Chart Elements and click Remove. If its not centered you can tell quick how far off it is. Other tools such as the angle separation tool can dial ya in quick with how far you are off but if APA is done correctly none of this should be required.